Fasteners are the smallest part of a structure. Bolts and screws are the most commonly used as fasteners for joining of materials. In this article, we will discuss the differences between bolt vs screw. 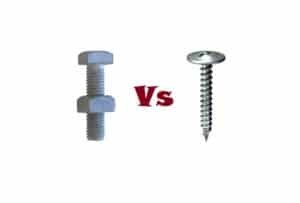 In this article, we will discuss the differences between bolt vs screw. 1. Bolt has an external thread at the lower end. 1. Screw has no external thread except one head. 2. Bolts are always assembled with nuts. 2. Screws are always used by itself. 3. It has uniform cross-section. 3. It has non-uniform cross-section. 4. It does not have any decreased shank. 4. It contains decreased or pointed shank. 5. The threads are spiral in shape. 5. The threads are helical in shape. 6. Holes are required for inserting the bolts. 6. Usually, screws are inserted without any holes. 7. Bolts are always fixed at a single position and do not need to be turned. 7. It requires being turned every time to be joined or to be removed. 8. Torque is applied to the nut(lower end) for fastening with the material. 8. Torque is applied to the head. 9. Bolts are larger in size. 9. Screws are smaller than bolts. 10. The structure that is joined with bolts possesses a greater strength. 10. It gives less strength than the bolt. Tags: Bolt Vs Screw, Difference Between Bolt And Screw.